The brewing team at Little Rivers has embraced the lacto life with the launch of its Sour Series. 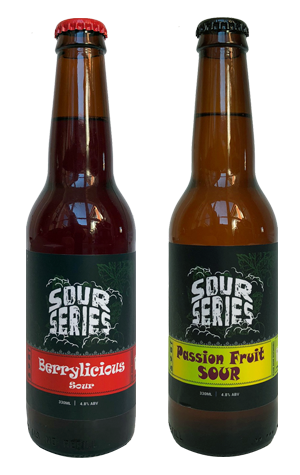 Kicking things off is a pair of kettle sours that may have started out in roughly the same place but end up as rather different beasts. With Berrylicious, the label might suggest a need to pucker up, but it's laden with so many berries the tangy, acidic side of the beer is very much playing second fiddle. You're given fair warning too: emptying a bottle into the glass is a stop-you-in-your-tracks moment, so bold is it in its lurid crimson glory. The berry sweetness is so intense it's nudging into cordial territory on the nose, while overall it's more rich fruit juice than fruit sour. On the other hand, Passion Fruit Sour brings the tang, something that is innate to passionfruit as well as the lactobacillus in the beer. The higher level of acidity makes this the more refreshing and sessionable of the two, unless, of course, you're the sort who used to enjoy sneaking a little more Ribena into your glass when mum and dad weren't looking.